Earlier this month Steve Jones (b/t) suggested that it might be helpful if those of us that work in the IT/database field shared four random days out of our lives. This is one of them. Number two in fact. The first one was the day after getting back from a long vacation, today is a bit more normal. Today isn’t a work from home day (I get two a week) so I got up at a more normal time. 6:30am. Got myself put together and went to my laptop, which is still up from yesterday. I did a brief check of my email to make sure nothing disastrous has/is happening. Quick check on my blog to see if I need to approve any comments, and another quick check of Twitter to make sure the world is still spinning correctly (that’s important these days) and I’m off to work. It takes me about an hour to get to/from work so I frequently end up with a meeting or two during the drive. In this case a quick catch up meeting on a couple of projects. Now I’m in the office, get logged in and clean up my emails. I had ~60 when I got in, which I realize isn’t a large number, but I do have to skim about 2/3 of them and answer a few so it still took me about half an hour. Note, the ones I’m answering here are quick opinions, comments etc., not any real work. Those I just mark as something to be looked at during the day and move on. Next, I took a short break on Twitter, made a comment, got into a brief political discussion (yes, I should know better) with someone I don’t know and was blocked. So pretty normal :). While I was checking email and getting my work done I had a couple of blog ideas so I added them to my list. One I’ll probably end up knocking out this week/weekend, the other will be a later on kind of thing. Otherwise known as my lunch break :). 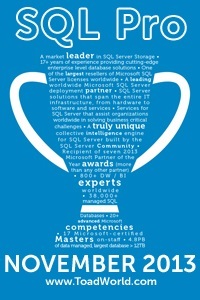 I got to host SQLChat on Twitter this month with the topic The death of the DBA. It was a lot of fun, great comments by a lot of amazing people. I was crazy busy trying to keep up with them. Well worth it though! We take turns watching our ticket queue, this afternoon was mine. It takes up a chunk of my time but I can still get some work done during. There was a problem that came in right before SQLChat and I had taken a quick look to find the cause before it started. Now I needed to take care of the paperwork that goes with the actual work. Next, I took a quick break to get a new keyboard from my laptop. It works SO MUCH BETTER NOW! And before heading home I spent an hour or so working on a load problem that I’ve been dealing with for a few days now. The biggest part of the problem is that this is an old DTS package that no one supports anymore. I can’t get the DTS components working on my machine so I’ve switched gears and I’m working on a bulk insert. But boy are there a lot of data problems! Oh well, hopefully, I have it figured out by tomorrow. And now my hour-long drive home. I listen to audiobooks on my drives to help them go faster. They are still long. And once I’m home it’s family time. Dinner, “it’s getting close to the end of summer so you need to finish your summer homework”, “mom, dad, can I PLEASE buy another video game”, “He’s mean”, “She’s annoying”, etc, etc. And before going to bed, a quick blog because I’m still insanely behind.